I made a hare material box for my friend Maria who was visiting from Canada. Unfortunately, the unseasonable weather curtailed our plans for meeting up, but we did manage a day visit which was lovely. 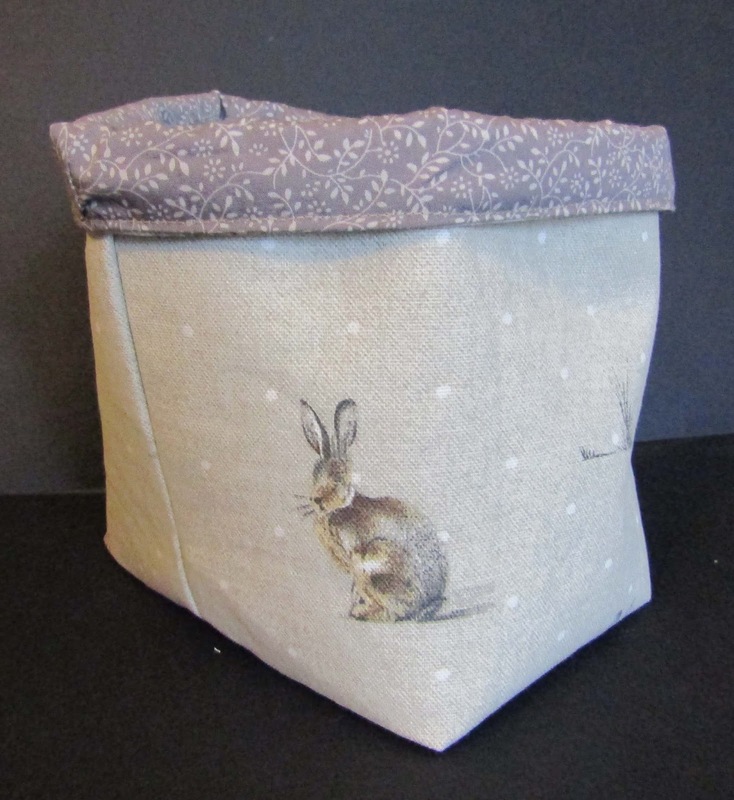 I made her a fabric box using this hare fabric - light and squashable for taking back on the plane. I have also made myself a needlecord pinafore using this pattern, 'Cleo' from 'Tilly and the Buttons'. The pattern is really well done with both written instructions and photos too. I made the knee length version and put the split in the back rather than the front. I used the automatic buttonhole on my sewing machine for the first time too - I had a few issues and had to unpick a bit, but this was because I couldn't find the 'buttonhole lever' on the machine. Eventually, thanks to the internet, I discovered where it was (up inside the part where the needle mechanism is held - but this wasn't obvious from the machine handbook). Thank goodness for the internet! I made a toile in calico first, just to check on the sizing. The pinafore is designed to be loose, but I wanted to be sure the size would fit my hips. Here it is - success! I had bought the needlecord a couple of years ago and it had been sitting in my material stash ever since. I used buttons rather than the dungaree clip option. Thanks, Briony. I love hares too and am starting (or should that be continuing) to add to my collection, slowly but surely. There is something so magical about them, isn't there? I was really pleased with the pinafore. I still consider myself a beginner in the clothes making world, so when something is successful, it's a huge boost to my confidence. Colour me awed. Not least because buttonholes are SUCH a beast. And I do love hares. And foxes. 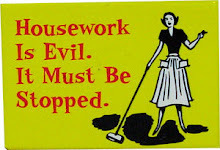 And most critters. Hares are my favourite, I think, due to the rarity of sighting and magical quality they have. (Also, Hares feature in the 'Little Grey Rabbit' books and in 'The Little White Horse' too - both of which had a lasting effect on me as a child and teenager. 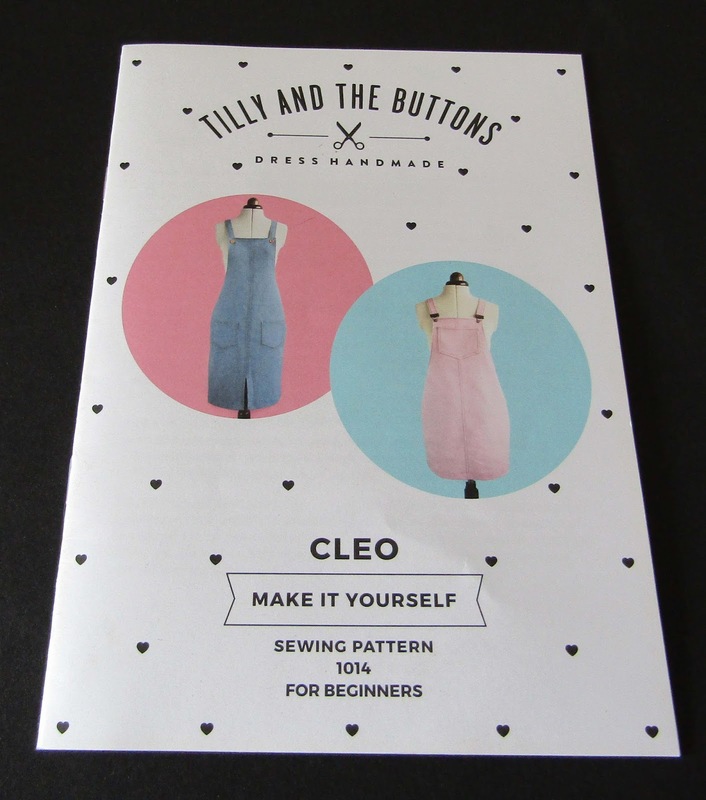 Definitely give it a go - I am sure you would make some lovely things. Thanks, Jo. This needlecord was reasonably thick and lovely quality so I didn't line it, but my second one is much thinner material (although I didn't line that either - now thinking it might have been a good idea!) Oh well, one for Spring, rather than Winter!